2009-09-30 at 07:54 Time flies. Apparently it has already been two years since VNDB first saw the light of day. Let me use this opportunity thank everyone for his/her contributions in the past year. 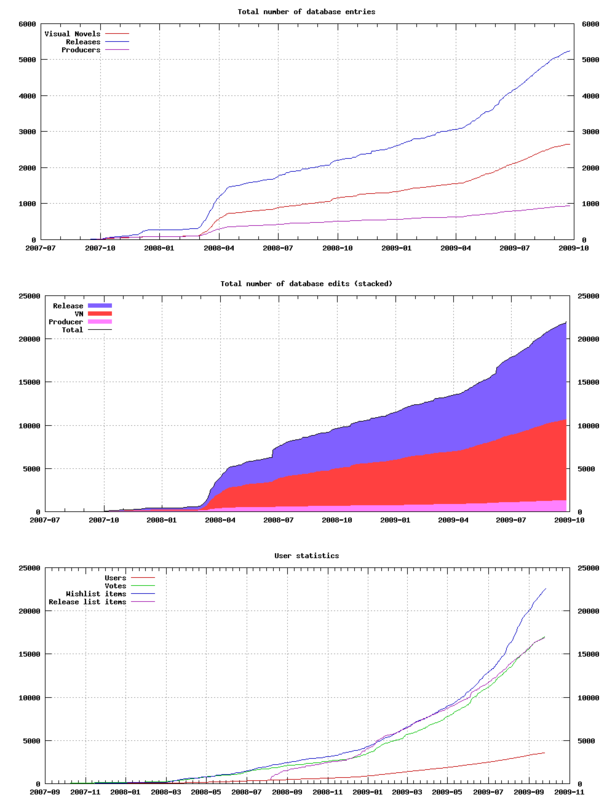 The database has nearly doubled in size and an increasing number of people are making use of VNDB. I've compiled some interesting graphs here. 2009-09-30 at 16:54 Happy Birthday VNDB! 2009-09-30 at 17:40 Happy basudei! 2009-10-01 at 18:49 Impressive. Long live VNDB ! 2009-10-01 at 18:51 oДo Long live teh Empire! 2009-10-04 at 16:28 Don't be so touched after just two years! Aim high! We shouldn't celebrate only the days that passed, but the many-many days that will come! Let's work for another two years! And when that time comes, for another four years, and so on! 2009-10-11 at 06:20 Happy B-day, I'm glad that I came here. May this place have another prosperous year!!!! 2009-11-17 at 13:43 Huuh, sure time fly fast. 2009-11-26 at 13:31 Long live VNDB! "It'll take more than these wounds to take me down! I drink milk every day, after all!"